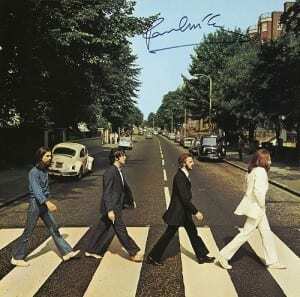 The Beatles have become immortalized through nearly every avenue imaginable. There are lunchboxes, dolls, coffee mugs, clocks, not to mention thousands of clothing articles dedicated to The Fab Four. Now, the Beefeater Grill UK restaurant has taken Beatles representation to the next level with a recreation of the group’s 1969 “Abbey Road” album. To celebrate The Beatles’ 50th Anniversary of the first time the band recorded at their renowned Abbey Road Studios, food sculptor Paul Baker has recreated the album cover entirely in breakfast foods. The food mosaic is composed of anything and everything one would find for a hearty first meal of the day. George is made of sausage, Paul in an ode to his vegetarianism is mushrooms, Ringo sports a coat of bacon and John, as always, is the egg man. Goo goo g’joob (sorry, I had to do it). The food comes from the Beefeater Grill’s chain and represents cuisine that can be found on the restaurant’s menu. Baker’s art is the fruit of four days of labor with help from three assistants. The final product, dubbed “Let it Bean,” is one of several food paintings Baker has done. His other works include art of Prince William and Kate Middleton kissing on the Buckingham Palace balcony, Winston Churchill throwing up the peace sign and the Queen’s 1953 coronation. Birthday needs can be in the kind of a one line, an set up estimate, or a entirely created poem or essay. The way in which the birthday want is shipped will count on the partnership to the recipient. I simply want to mention I am newbie to blogging and truly loved this web-site. Likely I’m going to bookmark your website . You actually come with excellent well written articles. Thank you for sharing with us your website page.